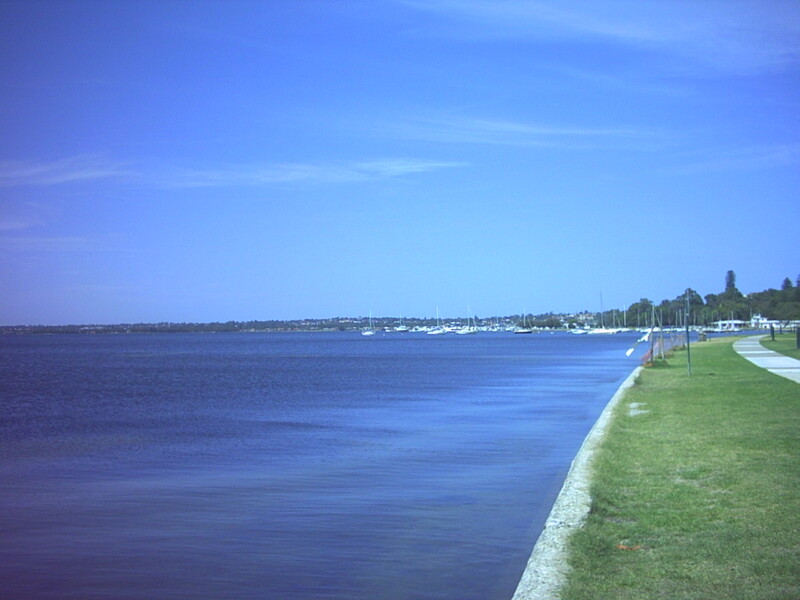 Tourist at home: the Swan River and the Edward Bruce Foreshore Path. | The mind is an unexplored country. 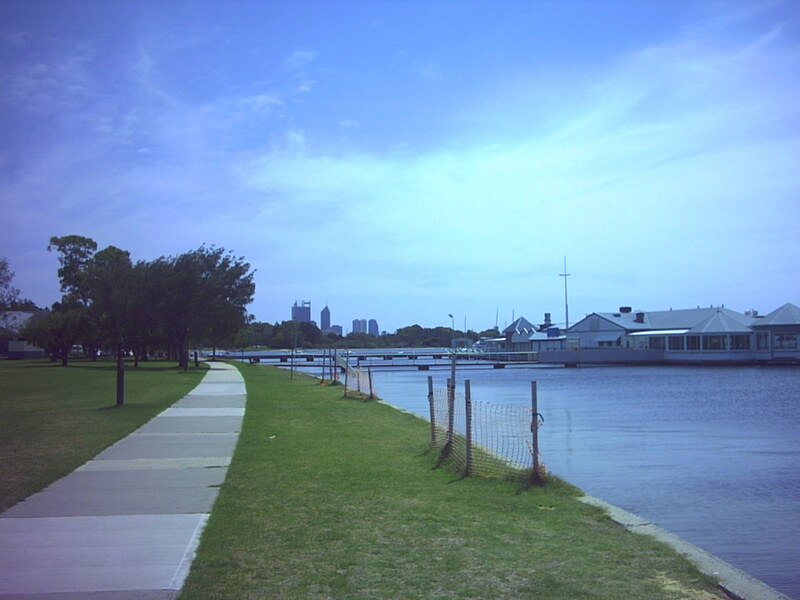 Tourist at home: the Swan River and the Edward Bruce Foreshore Path. Even though I’ve lived in Perth for more than twenty years, there are still a few surprises waiting within reach. I was ‘invited’ to take a few days off last week. I had planned to save those days for my trip to America next month, but the higher ups in the management insisted. It’s a long story. At any rate I decided to take a stroll along the Swan. A short train/bus journey delivered me to my starting point: Barrett’s Bread, home to the best almond croissants in all of Perth. Though some may argue. I remain strong in my convictions – three of which are still before the courts. I strolled down Broadway, which, not being the Broadway of New York, had no flashing lights or marquees. There was a laundromat and a pizza shop. I passed the Perth offices of the Alliance Francaise as well. Broadway ends at the Swan, and this is where the Edward Bruce Foreshore Walk begins. 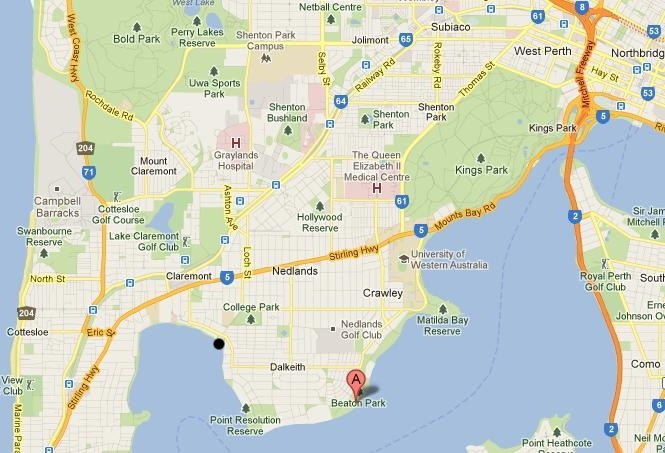 Perth’s central business district is situated up in the top right corner beside the orange line that marks the Freeway. Also, ladies and gentlemen, I point out for your interest the grey area on the coast in the upper left. 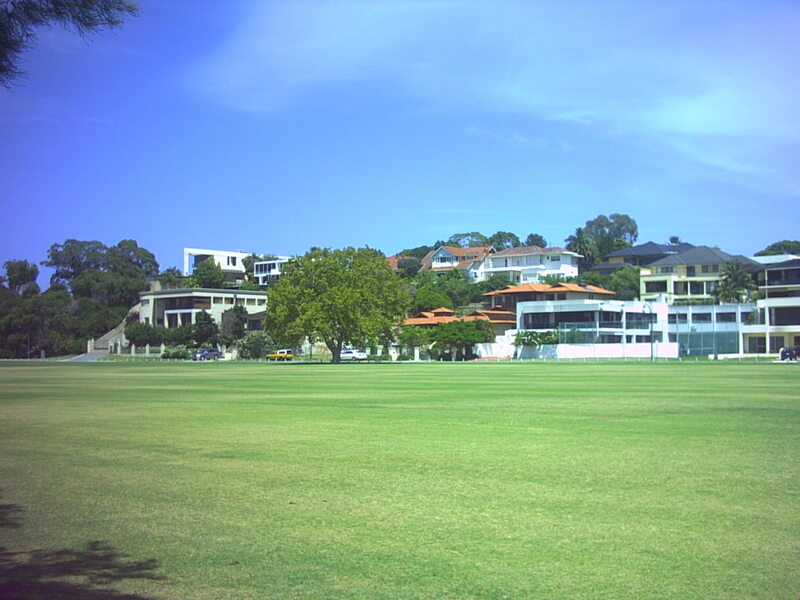 Campbell Barracks is home to Australia’s special forces unit the SAS. I had no idea who Edward Bruce was, and why he merited a memorial, so I did some investigating. 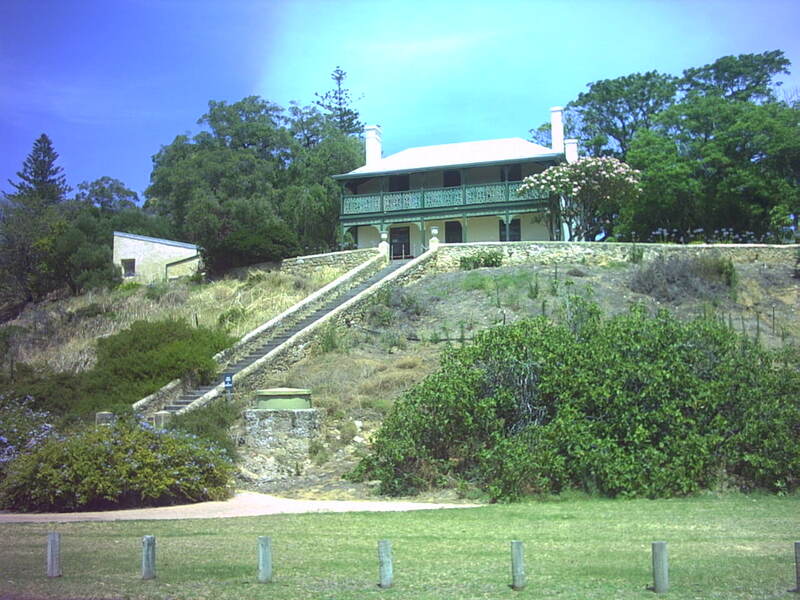 The gentleman’s full name was Sir Edward Bruce Henry Lefroy, and he belonged to Perth’s agricultural aristocracy. I was to encounter another memorial to another such family in the course of the walk. From the start of the Walk I could just see the top’s of Perth’s tallest buildings, the BHP Tower on the left, and the St George Building. The St George was originally the Bond Tower and was home to Bond Corporation which was headed by Alan Bond. I’m sure you can detect the common theme in all of that. The treed area just left of centre is the site of Heathcote Hospital. Heathcote, to borrow the parlance of a more genteel era, was a home for the bewildered. It appears in the second map, down in the lower right. 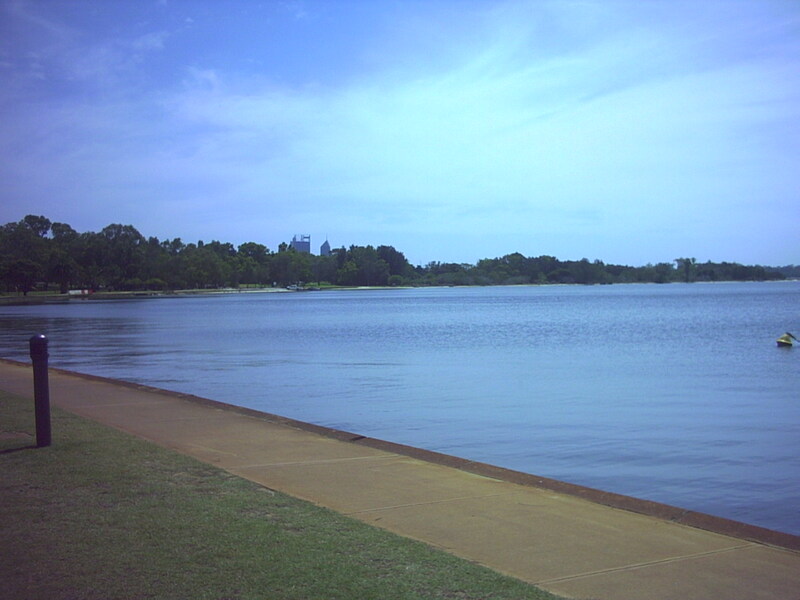 The river is about 2km (1 1/2 miles) wide at this point. Speaking of width, clicking on the photos will give you the larger view. 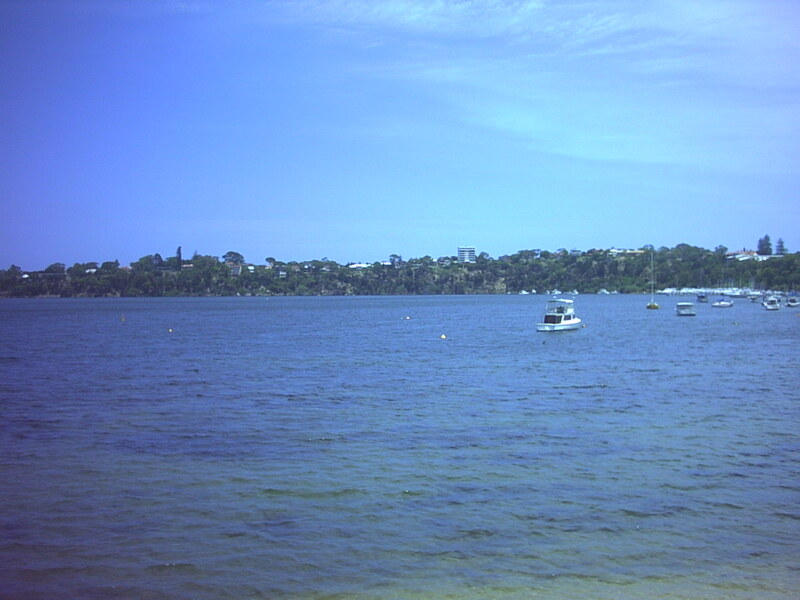 Looking west, the suburbs of Mosman Park and Peppermint Grove seem a long way off. Further along, another look back toward the CBD. With JoJo’s Cafe at the end of the pier. 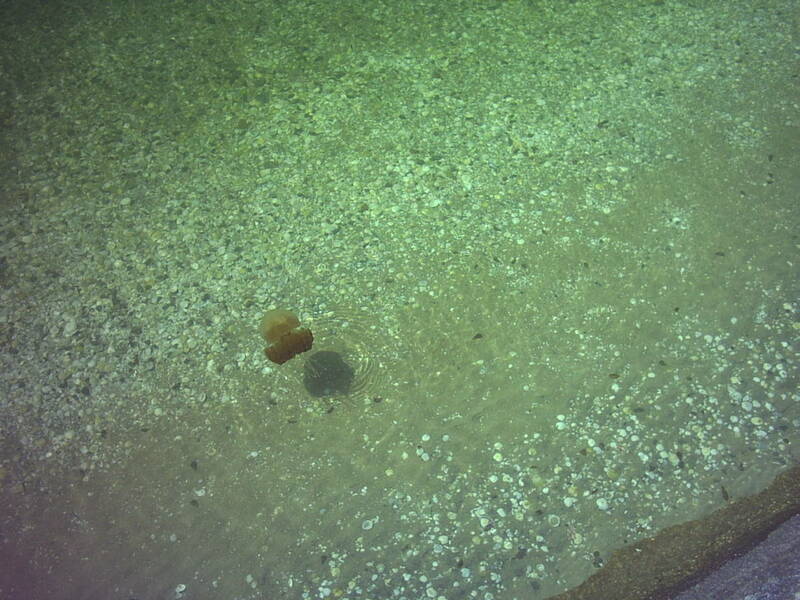 The Swan River is visited by several varieties of jellyfish at different times of the year. Normally they cluster in groups of several dozen – maybe this guy ate all his friends. 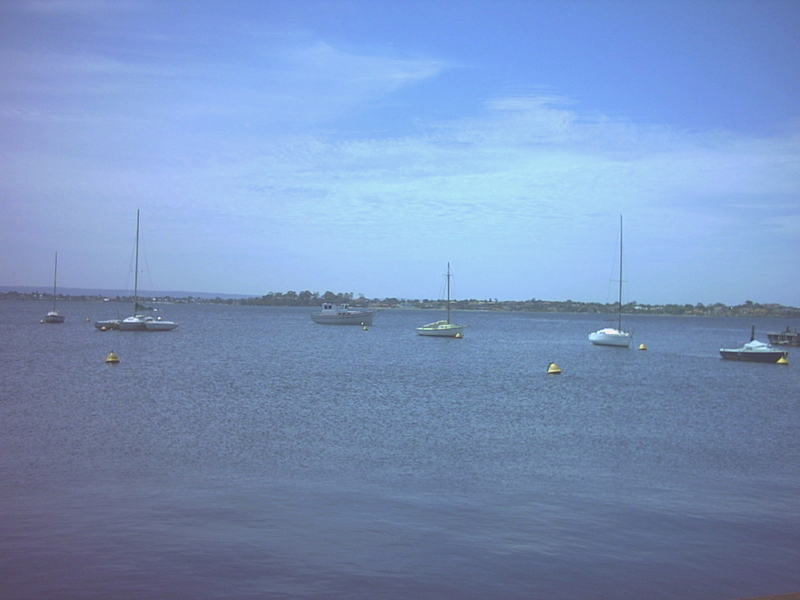 The riverside suburbs west of Perth are home to much of the city’s wealth. Nedlands, Crawley, Dalkeith – this is where new money rubs shoulders with old money. But the old money bought a better class of architect. This old place sits all by itself just a few hundred metres past the homes in the previous pic. Bates Motel, anyone? I thought it had quite an ominous aspect. The sign at the bottom of the steps says it’s a private residence but there was no activity that I could see. Maybe the residents were of the non-corporeal type. Sadly the reality, while interesting, is devoid of the supernatural. This is Gallop House, built by one of the region’s first settlers. One last look back at the city. From here, about four miles from the city, the skyline is complete. It’s more impressive from close up. Perth might be the most remote city on the face of the earth, but we are not without a few strange inhabitants. Some people! 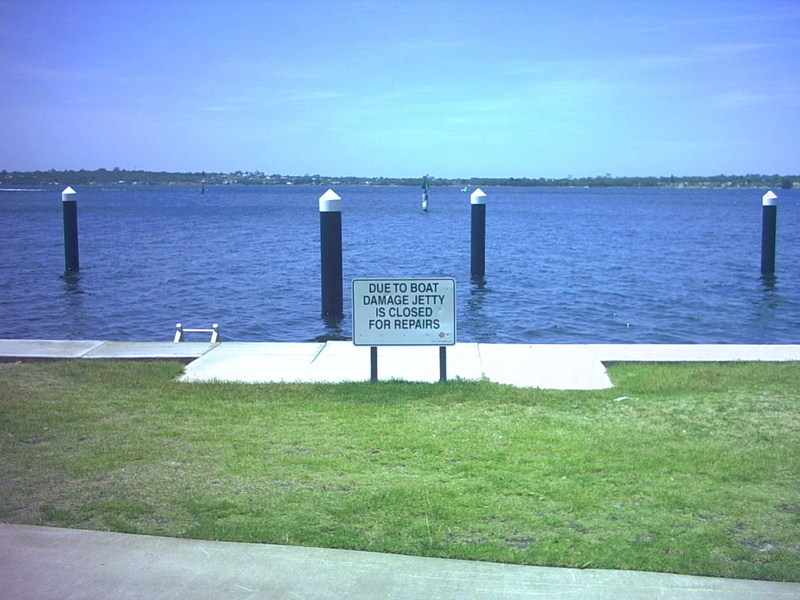 If they’re not leaving heads lying around in plastic bags, they’re stealing broken jetties. 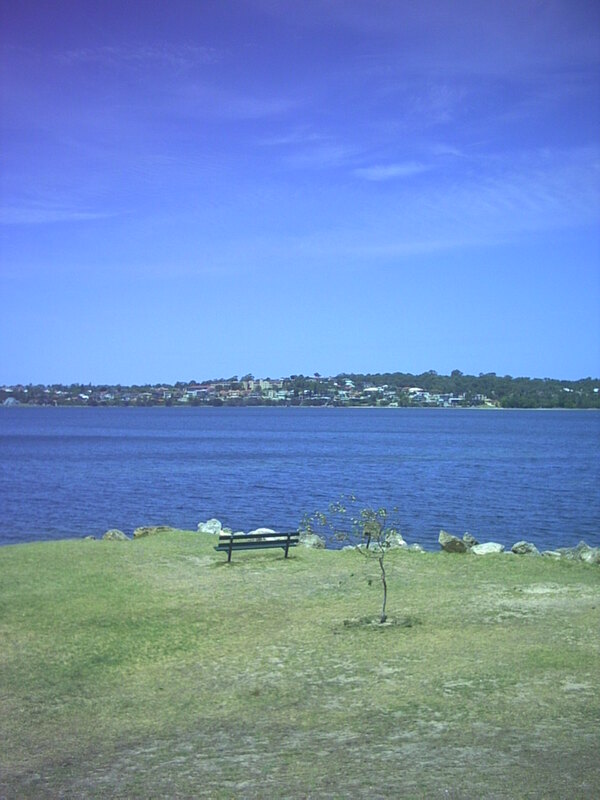 At the western end of the Edward Bruce Foreshore Walk – a place for quiet thought and meditation. It was a very pleasant stroll, and only better for the general absence of other people. Even allowing for the holiday season the foreshore seemed unnaturally empty. No complaints from me. The path ended at the bottom of a short climb. At the top I found another site with ghost potential: Sunset Hospital. There have been plans to use the site, but some of the buildings are claimed to have heritage value. I use the word ‘claimed’ advisedly. The hospital was built in 1904 but since its closure in 1995 it has been largely left untouched. As is happening at a few sites around the city, the developers and the heritage lovers argue sporadically and nothing is decided one way or the other. Nature, meanwhile takes its toll on the old buildings. The next part of the shore is private property so I walked through Dalkeith and got back to the river at the point marked by the black spot on the second map. Dalkeith very neatly fits Charles Bukowski’s definition of a nice neighbourhood: a place where you could never afford to live. The general lack of footpaths is itself a giveaway: who walks when they have Jags and Ferraris in the garage? I half expected that every little old lady I saw would reach for her mobile phone and report me to Neighbourhood Watch, but I made it through unmolested to Freshwater Bay. Cottesloe Beach and the Indian Ocean are only a mile or so beyond that ridge. Final pic: the site of the old Claremont Baths. The Swan is a shallow river and well suited to swimming. 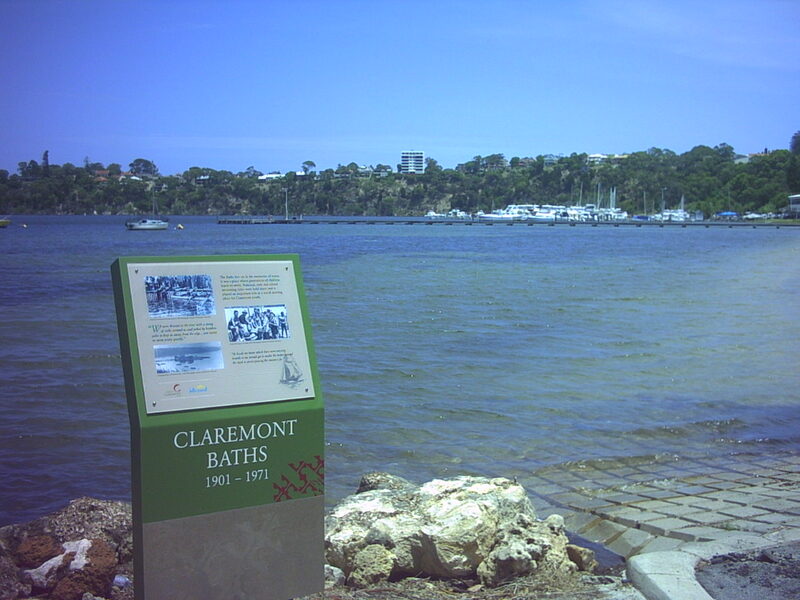 Here at Claremont, and at several other places along the river, public baths were constructed. This pic shows the baths from the outside in 1929. A strict segregation of the sexes was maintained, with separate hours for Gentlemen and Ladies. Next time you come back we should team up and clean Barrett’s out of those croissants. 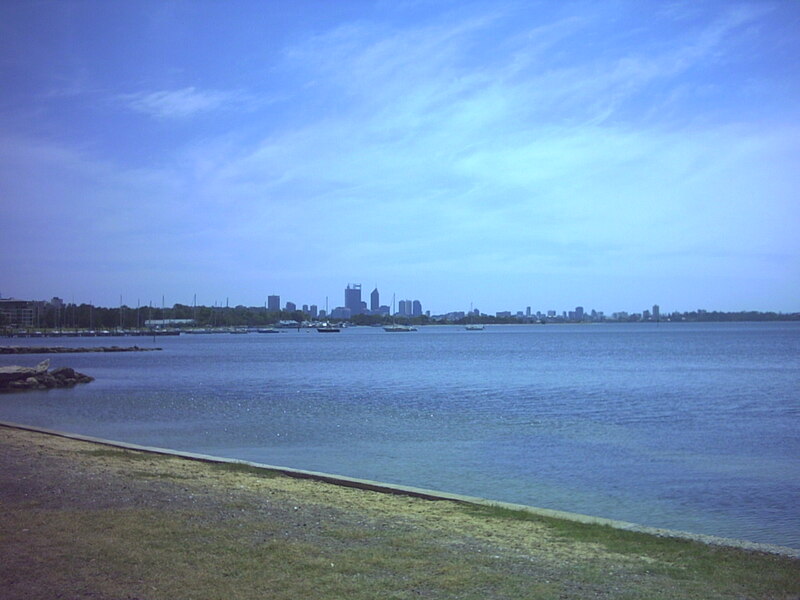 Cool pics…Perth looks like a very nice burg. Also, summer looks like it’s in full bloom down under. It was -5 degrees Fahrenheit with the wind chill this morning, so Perth looks especially enchanting at the moment. I can understand the attraction, but the week between Christmas and New Year was like a vacation on the edge of hell. Every day close to 40 C if not over it. The nights were hot with no breeze whatsoever. I’m making my first visit to the US in a month. I won’t be getting beyond LA but I am seriously looking forward to being in a place where their maximum is lower than our minimum.